The sophisticated design of Busch claw vacuum technology allows Mink claw vacuum pumps to operate at extremely high efficiency levels, which has a positive effect on the pumping speed and energy consumption. In practice this means substantial energy savings for the same pumping speed when compared to conventional vacuum generators. The contact-free operating principle of claw vacuum technology provides the additional benefit of nearly maintenance-free operation: None of the internal moving parts of the vacuum pump come in contact with each other, so components are not subject to wear. Servicing tasks such as inspection and replacement of worn parts are eliminated completely. The proven, completely dry claw vacuum technology of Mink claw vacuum pumps allows them to run without operating fluids in the compression chamber. This means that the possibility of contamination of the pumped medium and environmental emissions is eliminated. In addition, no costs arise for the purchase, replacement and disposal of operating fluids. 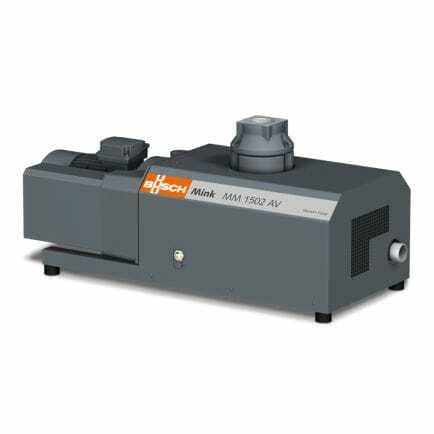 Mink claw vacuum pumps are air cooled, so installation and maintenance of a cooling system is unnecessary. Their contact-free operating principle allows them to run extremely efficiently throughout the vacuum range and to deliver constantly high pumping speeds during their entire life cycle. The outstanding reliability and long service lifetime of Mink claw vacuum pumps are also a result of the contact-free and dry compression. An intelligent sound insulation design allows Mink claw vacuum pumps to operate at low sound levels.